Dow’s Enlist Duo threatens household pets and other animals. Pets, farm animals and wild animals don’t know when and where a weed killer has been applied. They wander into 2,4-D-sprayed corn and soybean fields, roll on 2,4-D-treated lawns, eat 2,4-D on foliage and drink water contaminated with 2,4-D. For these reasons, they are often exposed to more intense concentrations of herbicides and insecticides than people. A 2004 study by Purdue University scientists showed that Scottish terriers exposed to lawns treated with herbicides such as 2,4-D had greater risk of bladder cancer than other terriers. A 1991 National Cancer Institute study concluded that dogs exposed to just four lawn treatments a year significantly increased their risk of malignant lymphoma. 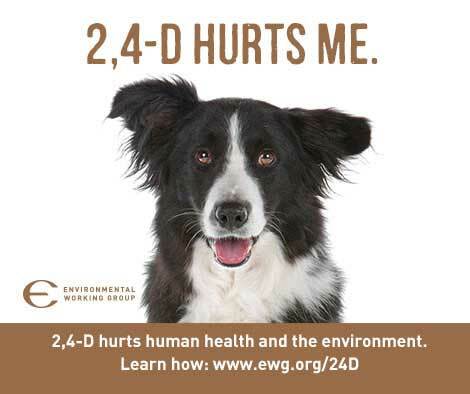 Domestic animals accidentally exposed to large quantities of 2,4-D can suffer lethargy, weakness, vomiting and convulsions. Hunting dogs near farmland are already at risk of exposure to 2,4-D and other pesticides from agricultural runoff onto wetlands where duck and other wildlife live. Tripling 2,4-D applications on crops would put these animals in even more danger. Wild animals do not have owners to look out for their safety. The EPA says that 53 endangered species, including four mammals and five birds, would be potentially at risk from increased 2,4-D use in the Midwest, where corn and soybean farms abound. The EPA said the risk could be managed by confining 2,4-D to fields, but it did not explain how wildlife and plants would be kept out of pesticide-contaminated fields. Honeybees are particularly vulnerable to pesticides. Bee colonies are collapsing in alarming numbers throughout the world. 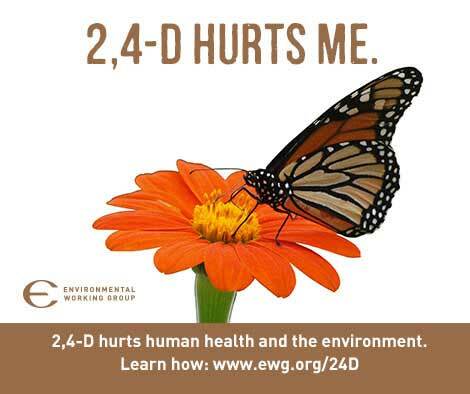 They are at heightened risk from 2,4-D. EWG’s analysis of documents disclosed by the EPA found that even in short-term tests for 2,4-D exposure, honeybees showed a variety of toxicity symptoms, including slow response to stimuli, reduced coordination, loss of equilibrium, hyper-excitability, lethargy, immobility and death. Drift of 2,4-D from sprayed fields would destroy flowering plants essential to pollinator colonies, causing significant economic harm. Other important insect species such as monarch butterflies are known to suffer from pesticide toxicity. 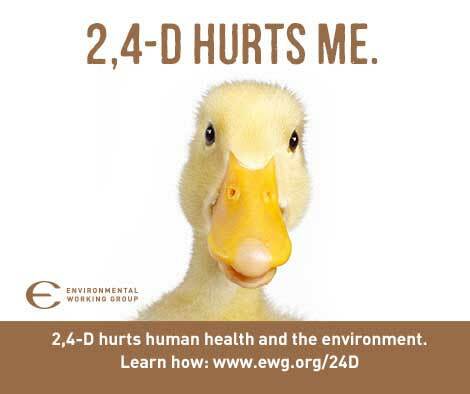 The bottom line: 2,4-D is harmful to pets and wildlife. EPA should not approve Dow’s Enlist® Duo for large-scale spraying on tens of millions of acres of American farmland.